I usually don’t make a general appeal to the public, but there is something that has seriously been disturbing me lately: People Who Don’t Spay and Neuter Their Pickup Trucks. There are so many “anatomically correct” pickup trucks driving around nowadays that it just shows how irresponsible people are. Everyone should know that these trucks are capable of breeding rednecks at an alarming rate. 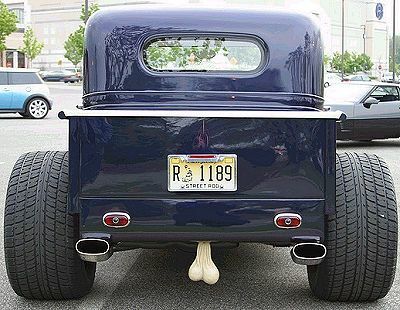 So, please, please, PLEASE, remove the low-lying anatomically correct things from your pickup trucks…it’s the responsible thing to do. So, I’m currently reading Thomas Sowell‘s book, Applied Economics: Thinking Beyond Stage One. I think that every American should read this book before heading to the polls this November because it is quite easy to get caught up in the expected benefits of a thing (Stage 1) and totally miss the fact that other consequences accrue (Stage 2 and beyond) to the decisions that we make and the people that we elect. Remember, while it sounds nice that somebody wants to tax the oil companies and give you a rebate, it’s always best to think about what that really means in the longer term. You just might find that your tax rebate will make it back into the coffers of the gas companies via even higher gas prices than we already have. The same is true with anything that a grinning politician wants to give you…even by force if he must. My advice is to vote for what is truly best for our country, over the long run, instead of voting for what you can get now. I’ve been away from my blog for quite some time and I don’t know if I’ll really end up doing too much more blogging now that Eternal Eyes Photography is getting started in full swing. Please feel free to check out the new site and, if you’re local, let us know if you need photos made. Why is it that I can scan and bag my own groceries in a “self-checkout” lane at WalMart approximately twice as fast as an actual “trained” cashier can check me out?